India has rejected news reports accusing New Delhi of bombing bunkers and killing “several enemy” soldiers in the disputed region of Kashmir controlled by Islamabad as retaliation for Pakistan allegedly decapitated two Indian soldiers. However, an unnamed senior military officer with the Indian army’s northern command declared, “We will retaliate, and when we do, we will come out with an official statement… A lot of planning goes into any army action. We will respond but at apt time and place,” reports Hindustan Times. “There was no retaliation [yet] whatsoever by us in the KG [Krishna Ghati] sector on Monday night. They [TV channels] go ballistic without asking us anything,” reportedly added the Indian military officer. According to Hindustan Times, news reports claimed the Indian army had killed “10 infiltrators” along the Line of Control (LoC), which refers to the border the separates the territory of Muslim-majority Kashmir controlled by India from the portion held by Pakistan. “We never said that army killed 10 terrorists. We simply said there was cross-border firing at two places along the LoC, including Uri,” an anonymous source from the military headquarters in New Delhi told Hindustan Times. On Monday, New Delhi accused Pakistan of fatally shooting and mutilating two Indian soldiers in an ambush at the Krishna Ghati sector of the Poonch district in Indian-held Kashmir. “Sources said the Pakistani action was a deliberate provocation and virtually invites Indian retaliation, which is now assured. It reinforces once again that no normalization of relations with Pakistan is possible in the near future,” reports Hindustan Times. 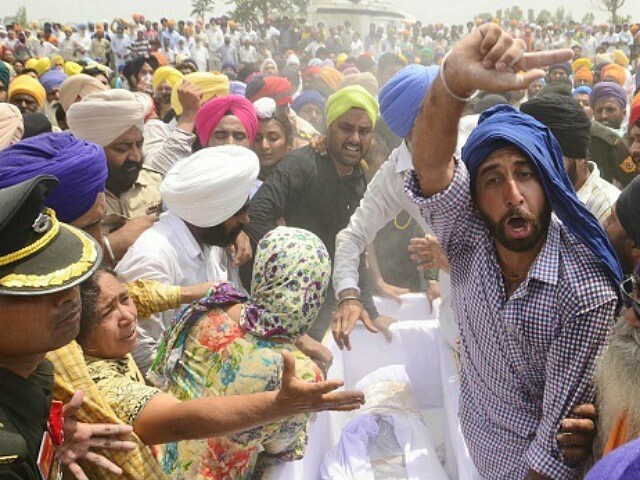 “For the third time in seven months, India finds itself holding the mutilated bodies of its soldiers. Each of the three instances in which soldiers have suffered the worst form of death came after the surgical strikes on September 29 last year, when the Narendra Modi government decided to take political ownership of the stealth operation into Pakistani territory,” it adds in a different article. India’s fellow nuclear-armed neighbor Pakistan has denied the accusations. New Delhi has summoned Pakistan’s chief envoy in India Abdul Basit over the allegations. “Foreign Secretary [S Jaishankar] conveyed India’s outrage at the killing and the barbaric act of mutilation of the bodies of two Indian soldiers on May 1,” proclaimed India’s Ministry of External Affairs (MEA) in a statement Wednesday, reports CNN. Pakistan, its ally China, and their regional rival India all have competing claims to the Himalayan region of Kashmir. Although China has remained in the shadows during the ongoing clashes between Pakistan and India in Kashmir that intensified after last September, Beijing is reportedly considering interfering in the “turbulent” conflict in retaliation. “If New Delhi chooses to play dirty, however, Beijing should not hesitate to answer blows with blows,” declared an editorial published by China’s state-run Global Times. India and Pakistan have fought two wars over Kashmir, resulting in a ceasefire agreement in 2003. Despite Pakistan denying its alleged involvement in decapitating the two Indian soldiers, “Blood samples collected by Indian investigators have confirmed that Pakistan army personnel killed the two Indian soldiers and mutilated their bodies,” reports Times of India (TOI). “The trail of blood is of Pakistanis who came across [into Indian-held Kashmir], in this case personnel of the Pakistani army. This proved that the killers had come from across the LoC and had returned,” it adds. News outlets identify the two late Indian soldiers as Paramjit Singh, 42, from the 22 Sikh Regiment, and Prem Sagar, 45, of the Border Security Force’s (BSF) 200 Battalion. Tensions between nuclear-armed neighbors Pakistan and India have been escalating since last year. The already strained relationship between Indian and Pakistan deteriorated further following the July 2016 killing of Burhan Wani, commander of the Kashmir-based terrorist group Hizb-ul-Mujahideen, by Indian troops. In September 2016, tensions intensified further after India accused Pakistan of helping militants carry out an attack on Indian-held Kashmir that killed at least 18 Indian soldiers. In retaliation, India attacked Pakistan-controlled Kashmir with “surgical strikes,” reportedly killing an estimated 38 alleged terrorists. Pakistan accused India of specifically targeting Pakistani military personnel, killing two soldiers and wounding nine others. India has long accused Pakistan of backing Islamic terrorists in Muslim-majority Kashmir who are fighting for independence from India or for a merger with Pakistan, a charge that Islamabad denies.